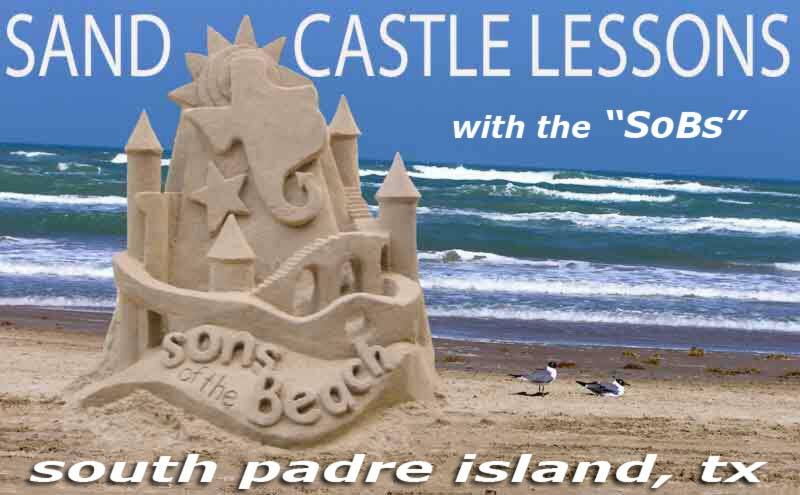 South Padre Island, Texas is one of the few places in the world where you can get private and group sand sculpting lessons from world class master sand sculptors - the Sons of the Beach Sandcastle Wizards. Special Group Experiences - photo-ops; contests, team coaching & more! 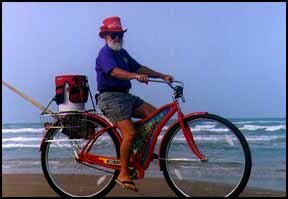 Over the past ten years we have helped literally thousands of people to have more fun on the beach. 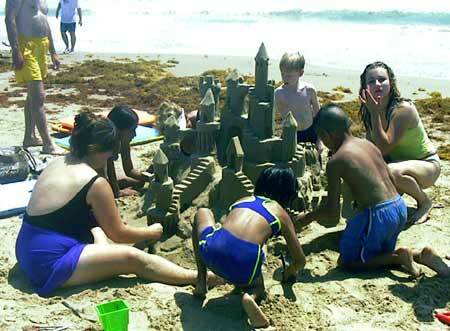 An hour or two of instruction from an SoB Sand Castle Wizard and we WILL have you building better sand castle - no artistic talent required.When you reserve a date for a lesson, one or more of us will meet you on the SPI beach of your choice with all the necessary equipment.... you don't have to bring a thing other than a desire to learn how to make sand stand.We offer a variety of instruction options and will be glad to help you decide which best fits your needs, based on your group numbers, budget and level of expertise. 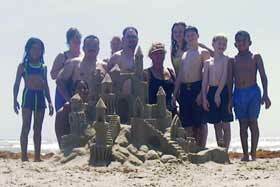 Note that SoB sandcastle lessons are NOT just for kids! 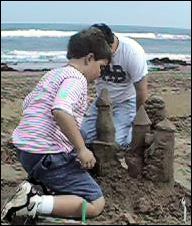 In fact, very young children may not have yet developed the motor skills necessary for learning the relatively sophisticated SoB techniques of building. Parents need to take the lesson too, so when the child is old enough s/he can learn from mom and dad. 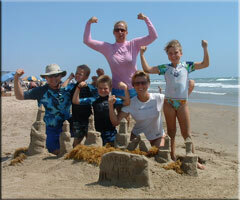 Treat your group to hands-on sandcastling instruction in an entertaining format. 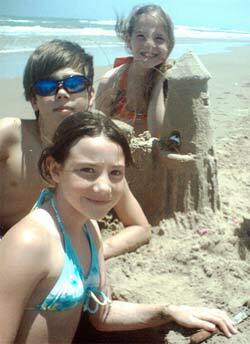 In just an hour you will be building and carving very cool sand structures - no artistic talent required. 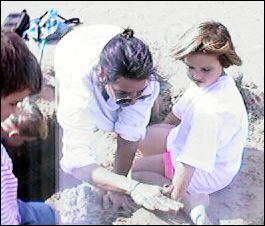 Sandcastling can be tied in with many areas of study, including art, group dynamics, science and history. It is also a fun, "beachy" team-building activity that many major corporations are starting to notice. Our technique - we call it "A Modified Drip" - involves digging a hole down to the water table and withdrawing super wet sand from the bottom of it. 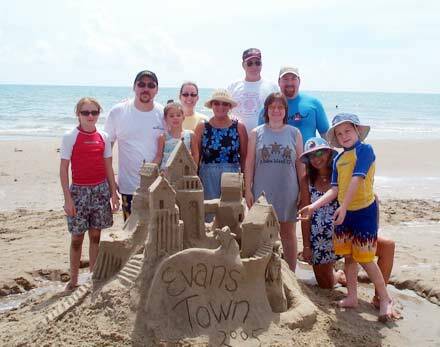 We'll show you how to build towers, walls and arches and then help you carve them into recognizable structures. We provide all the carving tools you will need and we'll even leave a few behind so you can keep playing after we go. 2 hour, 2 instructors (minimum) - SOBs will organize a contest for your group including a small demonstration castle... a beginners lesson and beginners tools, $100 per instructor per hr and a nominal equipment usgae fee. 2 hour minimum - the team gets the benefit of the experience and technical skills of the coach, great for management seminars, leadership training, and other team oriented groups. Can be presented in a contest form or as a group project, perhaps with the group logo carved on it... great photo op!... $100 per instructor per hr. For more details, see Team Building Page. Christy gives lessons - en Espanol tambien!